Why Do We Need Fresh Air Ventilation? Ventilation is best described as “movement of air which provides a clean and odour free environment for people in any enclosed space”. Good ventilation is an important factor in our everyday living. Poor air quality can be attributed to many problems arising in the workplace and in the home. It is believed to contribute to a significant loss in productivity, low morale and higher rates of sickness. Providing good ventilation in commercial buildings is to provide conditions under which people can work comfortably and safely. A heat recovery ventilation unit provides a clean, fresh environment into your building. It delivers fresh filtered air from outside the building to your working environment and extracts stale air from high moisture areas. At the same time it recovers up to 95% of the heat from the exhaust air and transfers it to the incoming air. With a heat recovery ventilation unit you can maintain a high air quality without excessive additional energy costs. The technology behind the energy efficiency of the Lossnay sysetm lies in the construction of the core which enbles exchange of both latent heat (humidty/moisture) and sensible heat (temperature) to maintain a comfortable internal environment for minimal energy consumption. 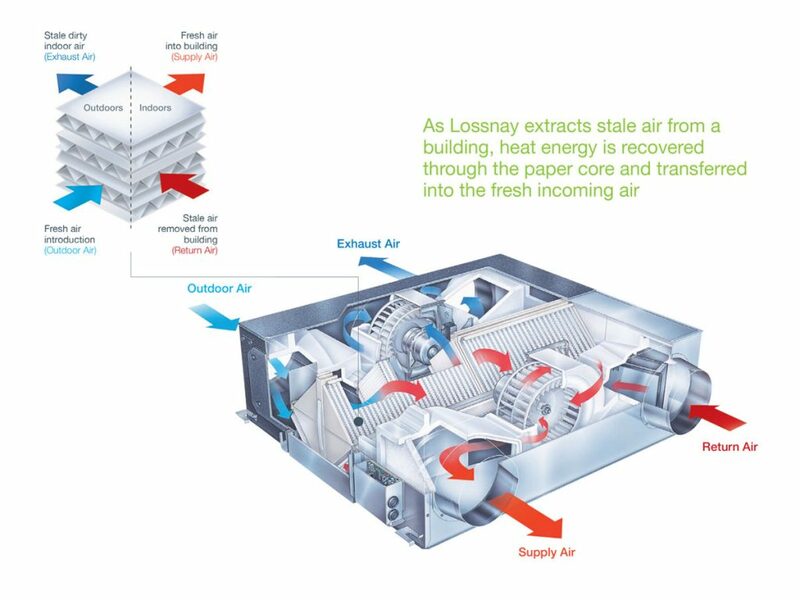 The Lossnay core is essentially a diaphragm made of specially processed paper which fully separates the inlet and exhaust air supplies ensuring that only fresh air is introduced to the indoor environment. 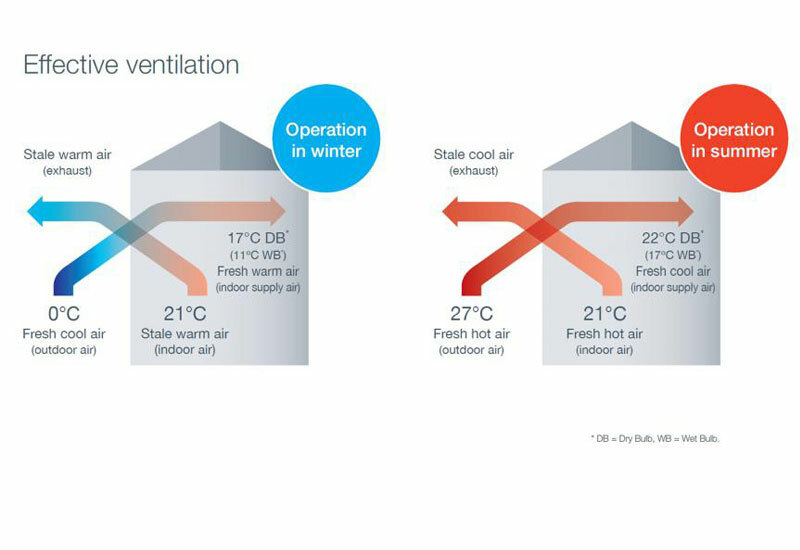 Traditional forms of MVHR use plastic or metal cores only allowing sensible heat recovery, Lossnay’s paper core allows total heat recovery including both sensible and latent heat. 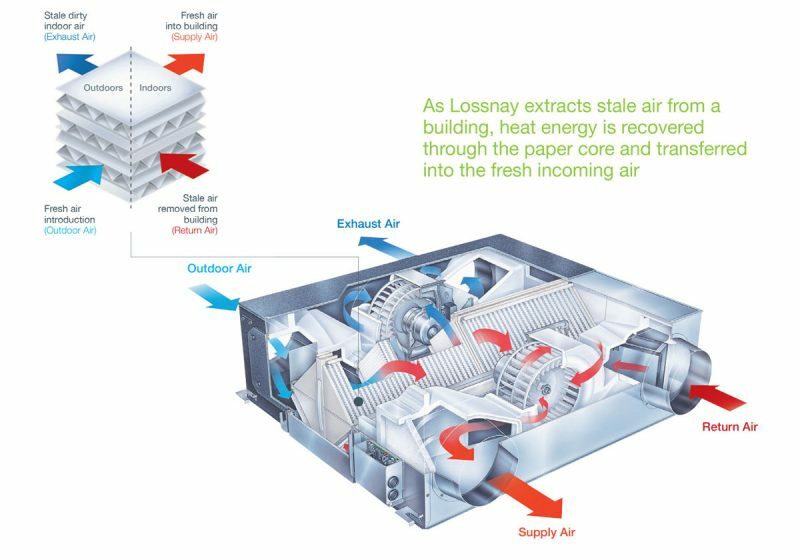 Lossnay’s simultaneous air exhaust and supply provides balanced and effective ventilation allowing for a clean, fresh internal environment to be maintained in an energy efficient and cost effective manner. One LGH-25RX5 serving one PLA-RP71BA. Room size 7m x 7m, 140w/m2 heat load. 7 people per room, 10l/s/person of fresh air to meet Part F requirements. Maximum amount of fresh air to be introduced is 30% of the fan coil volume. Ceiling cassettes may require fresh air casements. Free cooling is not available below 8ºC when interlocked with Mr Slim or City Multi units. Lossnay units can work either on their own to provide fresh air into a room, or in combination with Mr Slim or City Multi air conditioning ceiling cassette and ducted units. 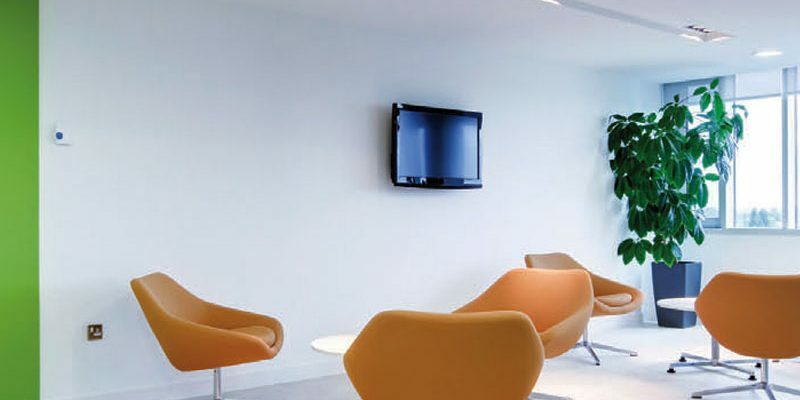 unit are connected by a two core communication cable, they can work together to optimise both comfort and energy efficiency. Contact us today and discuss ventilation installation and maintenance options available.